I thoroughly enjoyed speaking to the ladies of my church last Saturday at the annual Spring Tea. All the tables sparkled with the hostess' finest place settings and table decor, each unique and special. 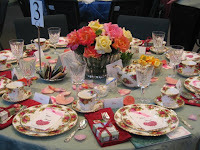 My friend decorated our table with the china, Old Country Roses, a favorite of mine. A neighbor let her raid her rose garden for a bouquet that matched the pattern perfectly, with extra petals dotting the tablecloth; silver and crystal sparkled. It was lovely. All over the room, women chatted and oohed and ahhed as they walked among the tables, enjoying the creativity of each one. As I told my story, I watched as women nodded, smiled, and cried. Many pulled me aside afterward and confided that they knew what I was talking about. We are sisters in the challenges of life. Yet, I was driving with a friend to the movies and as we talked, she mentioned that her life right now couldn't be better. She is happy in her marriage, her home, has a new granddaughter…all is well. I rejoiced with her as she talked and encouraged her to enjoy this time. But I also know that life has a way of turning the corner to reveal heartbreak and tragedy when we least expect it. We know of a family whose 13-year-old son fell from a tree and is in Children's Hospital with severe brain trauma. Another family has just gone through the valley with a five-year-old daughter who now has a new kidney but struggled each step of the way. Heart attacks, falls, depression, death. We never know what trouble is ahead of us but take heart. Jesus is alive! He overcame death so that we can have life…now and forever.